The good news is that I am feeling a bit better on an everyday basis. The really bad, painful infection I had has finally (mostly) cleared up, so I'm not reliant on heavy duty painkillers anymore. The bad news is that, my actual health condition is a bit worse than the infection. Which means that I'm going to have to start a course of radiation therapy again. But not to worry anyone too much...since I am now getting regular checkups (unlike the last time when you know, I stupidly tried to tough it out until I was almost bleeding to death(!!)) I am not going to have to get surgery or things like that. I guess I will have to face the ongoing fatigue issues, but well...I what to expect, and have strategies to deal with it. In the meantime, if you want to see short posts from me and you are on Facebook, please consider Liking my Facebook JustBento/JustHungry page, which has been growing steadily since early this year (when I finally started paying attention to it. ^^;) I am continuing to translate a few Cookpad recipes every day (previously) - if you want to find ones I've done, look for 'translated by makikowi' at the bottom of the recipes. I also have a new series in store for JustHungry starting next week, which I hope you'll enjoy. 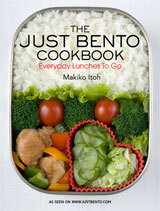 And for you bento fans, yes JustBento is coming back in full force soon - it's not dead by any means! You may see some other writing for me somewhere very soon too. ^_^ Stay tuned! And...thank you so much for your continuing patience and support as I battle my health issues. Submitted by maki on 2013-10-24 07:04. My thoughts are with you and I love love love your amazing work and recipes! I used them always when I was living in Sydney, and continue to refer to your website all the time now that I am living in Tokyo. I love your book, too. You're doing an amazing job fighting your cancer. I lost my father three months ago to the disease. Maki, your health is the most important priority right now. Your readers think you're fab and just want you to get better. I know it's not Japanese, but a common Korean idiom is to say 'Fighting!' or 'Hwaiting!' when supporting and encouraging their comrades. So much love and 'Fighting!' to you Maki - please take care. Hi Maki, I'm sorry to hear you're still having some health problems...I hope this is just a hiccup in terms of your complete recovery. Your writing brightens my day, and you are always the blogger I turn to when I have a japanese food question! I hope it helps to know you are appreciated...your words are not wasted, but go out into the world like seeds that grow a garden of ideas and experiences for others. Thanks for that! :) And speedy recovery to you! Feel better soon Maki. Praying for you! Thank you for the update, too bad about the need for ongoing treatment；so glad to hear you speak of the writing you are planning. I've been reading your blog for a long time and I just wanted to say how much I enjoy it and that I am sorry to hear about your problems. I wish you all the best with your health. I know what it means. Take lots of care - we are waiting for you here. Don't worry about us. Some of have been here a while and will continue to be. Take your time, get better. We will be here when you are ready and able to be here too. My best wishes, Maki. I've been an avid reader of your blog for years and it's a shame you're to have to go through with radiation again. Get well soon Maki-san! I've been lurking on your blog/s for years, I love what you do. All the very best from over here. All your fans are cheering for you and sending love and good wishes your way. Hi makiko...you are quite an admirable woman! Inspire of your health condition you stills are for your blog followers. By the way I discovered cook pad and I just love the recipes there...so simple and mostly Homecooked and comfort food...oh so you are that translator...yes I have come across your name there. I hope you are feeling better soon/ I'll be looking forward to your future postings. I hope you get better soon. You have been so strong in all of this You will overcome this "bump in the road". Dear Maki, fight for you and all the people who love you, your family and friends, and all of us, unknown far-away friends who support you with thoughts of love. Take care of yourself. As has been mentioned already - many of us have followed you for a while and will be here whenever you feel like writing, regularly or sporadically. Mostly, though, we are all hoping for the best recovery possible for you. Take care and my most profound wishes are for your healing quickly and forever. You have an amazing talent for communicating the written word and flavors from the kitchen and your past experiences..
You are my favorite person-who-I-have-never-met. As I make my way through health issues with myself, my husband or my mother, I often think of you -- your strength and your perseverance. I also appreciate when you open up and share your frustration, anger, and humor. Thank you for sharing so much of yourself. For now, focus on your health. We readers will be here when you get back. I am very sorry to hear you're going through this. Rest and recover! We all look forward to your food blogs when you're ready. And thank you for sharing your update. I am a long time lurker on this site. You have been a huge help to me, as I am married to a Japanese man who loves and misses Japanese food. His mother & sister are back in Japan and unavailable to teach me how to cook it. I found your site a while ago and it has helped me immensely. Please know that you have people all over the world who care about you and are pulling for you. Take care of yourself, and know that there is a worldwide web... Of support! Hang in there, Maki! Please rest, get strong, and write for us once you're better. You have a lot of fans supporting you. Maki-- Good luck with your treatment. I will be thinking of you and wishing you the best. so happy to see all the well-wishes from others here; I came to do the same. there is so much love for you out here in internet land. fight the good fight! you can do it Maki-san!!! With Fall here, I'm definitely looking forward to some seasonal favorites once you're feeling better. It's good that your painful infection is somewhat abated. I am hoping so much that the radiation fatigue is minimal and that you have the energy to do at least some of the things you enjoy. As far as the blog - there is so much on here already! I looked back at your article about Jiro Dreams of Sushi the other day when I had the chance to see the movie. Your essays are always so intelligent and illuminating that they are a pleasure to come back to. I'm glad you're on the road to recovery. Just keep on taking care of yourself, that's what's most important! I appreciate what you have given people with your site and with sharing news of your health. I hope you continue to improve and that the treatments go well! Take care of yourself, Maki. I sincerely hope you'll be better soon. Please take care of yourself, we're all thinking of you! Please take care. I hope you get well soon! Dear Maki, Please just take care of yourself, that's the problem with we women. We always put everyone else first. So new slogan "Maki first, all else second" take care will definately start following you on Facebook. There are so many people out here who love reading your posts about food on Just Hungry and Just Bento. Not one of us, I am sure, would wish you to concentrate on anything but getting better. Look after yourself, Makiko. Always remember to keep yourself focused on God! Take care. Just wanted to say take care. I still refer people to your blog all the time! I feel like I do every day. Take your deep-sleep naps. Everything else should be taken easily. I had radiation so know the aftereffects of exhaustion. Neverheless, the radiation treatment will help you and ultimately make you cancer-free and stronger. Your followers around the world wish for health for you. From the comments, you should feel the immense respect and love. I have just "met" you tonight on Quora and greatly admire your very helpful answers regarding Japanese culture. Your website is so interesting! In 6 days I am going to Tokyo, so your insightful articles and now this food site are valuable. Best of luck with your health problems, stay strong and hopeful! Please continue to take care of your lovely self! I really enjoy your "voice" on the blogosphere and am excited about your new series of food-related topics. Thank you! and others who translate the Cookpad recipes. I recently moved to Japan with a bunch of food allergies on board, which means I cook a lot! Cookpad has been so helpful! to me making use of local ingredients and enjoying variety in my meals. I wish you well. I live with ongoing fatigue due to various health issues. Just take it one day at a time and enjoy what you can of what each day brings. I enjoy hearing the crows caw and the sun that comes in our large, well placed windows. Sending you comfort and healing from Seattle! I hope you can take the time you need to recover. I love your blog and love your recipes. It always brightens my day. I hope you feel your best soon :) I found your website by clicking many different links online and your page is by far my favorite. I am happy to hear that you feel better to bring the page back to full force. Take good care of yourself. For a while I didn't visit your lovely blog and I am not on Facebook so i was unaware of yr health problems. As a former cervix cancer patient I want to send you all my support and loving and I am so hoping you will get trough this latest radiation therapy without too much health loss and effort and naustiousness and stuff. I want you to know I really love your web site which I always visit to improve my Japanese cooking although I am doing that for more than 20 years now. Thank you so much for your lovely and elaborate recipes and tips and good luck to you and your loved ones. Take care!! Thank you so much for your blog. It´s always a pleasure to read your posts, but please, dońt forget to take care of your health. I've been following you for years, and I'll still be there whenever you come back. Have many restful naps ! I've been a big fan of yours since I first read an article of your in the Japan Times. Just want to add to everyone's comments and tell you that you are amazing. You have that real fighting (がんばって）spirit. Keep doing what you love and it'll keep your mood up on tough days. Please take care of yourself. I won't be able to have confidence to cook without you. God bless you. Maki, your blog is truly inspirational. Your passion for Japanese food is infectious and everytime I visit Just Bento, my love for Japan continues to grow! Surround yourself with support and love, I wish you all the best and look forward to many more knowledgeable posts from you! Take a good care of yourself and just believe, everything will be just fine! Always loved reading through your websites. I hope your health quickly improves. I love food which is why I've been reading your blog for years. I still visit your blog to find out how you're doing. May I suggest a high raw vegan diet?? People with cancers have cured themselves with a high raw vegan diet. Chris Wark was was diagnosed with Stage 3 Colon Cancer in 2003, at 26 years old. His site is www.chrisbeatcancer.com/‎. He beat his cancer, chemo-free. I personally went vegan the year after my sister was diagnosed with breast cancer in 2011; she was 40 years old. I was 41yr, and I ate healthy already (at least I thought so, but I wasn't taking any chances). I wanted to make it even better. I gave up eggs which was the main animal by-product I ate. Going vegan, a plant-based diet is focuses on whole plant foods: fruits, vegetables, legumes, grains, nuts and seeds, zero animal products (and not processed foods that were once whole foods). No meat, fish, butter, milk, eggs, cheese, gelatin or other animal by-product. Consider this. The human body is able to repair/replace every cell. Every 28 days, your skin replaces itself. Your red blood cells, 4 months. Your taste buds, 10 days. Only our brain and eyes are the same age as we are. Just try to imagine eating clean / alkaline-forming / plant-based diet for 30 days (I used 30 since it takes 30 days for a habit to form; it's enough time to gauge changes, how people feel etc). How the body is able to repair/renew our cells to be healthy, thrive and function as they should. Energy levels go up, clarity, people lose unhealthy weight. Symptoms disappear, and chronic illnesses (even cancer or your infection) can be reversed over time. Cancer cells thrive in a acid body/environment. Eating a plant-based diet helps keep the body in an alkaline state. Try green juicing which allows the phyto-plant nutrients, vitamins and minerals to be absorbed by the body. I am so proud of how you have dealt with your issues. I am praying that this will all be over soon and become only a distant memory. Thank you for your continued attention to your web logs. Bento boxes are my favorite. Happy Holidays and all the best to you. Best wishes for a continued improvement; you suggest that you are in France where the medical care is first class. I just wanted to say, I love both your websites and I hope you feel better soon. You are doing great work. I've been using both your sites since discovering them just recently. Keep up the good work and the good fight!